10) Fulham: There are other teams in England than the usual big ones, and Fulham was a huge surprise in 2010 as they made it to the UEFA Europa League final. In spite of losing to Atlético Madrid, their performance deserves all the credit it can get! 9) FC Copenhagen: I admit that as Brøndby fan this hurts, but their overwhelming success in the Danish league and the Champions League obliges me to include them here. 8) SC Internacional: the Brazilian side won the Brazilian championship and the Copa Libertadores. 7) Ghana: The Ghanaians proved they are the best team in Africa, in spite of losing the Africa's Cup of Nations final to Egypt (who I nevertheless don't include for their World Cup qualification circus) with a young team, that later in the year, in the World Cup, became the flag-bearer for Africa. They had the best fans and a splendid team that did not play as naive as in 2006, but gave us one of the greatest dramas of the World Cup in the quarterfinal against Uruguay! 6) TP Mazembe: the Congolese side are undoubtfully the best team in Africa. Winner of the CAF Champions League, they came to the world's attention as they defeated SC Internacional in the semifinal of the FIFA Club World Cup, to become the first African side to make it to the final! 5) Uruguay: One of the greatest footballing nations in the world upset many by its powerful return to the world stage, making it to the semifinals in South Africa, and becoming the best South American side. 4) FC Barcelona: "Only" won the Spanish League in 2010, but they are still the most entertaining and best team in the world, something they have shown in particular in the second half of 2010, notably their incredible 5-0 victory against the arch-rivals of Real Madrid. They are again the team to watch in 2011. 3) Bayern Munich: Has had a poor fall in 2010 in the Bundesliga, but in the first half of the year won the "Double", and also made it to the UEFA Champions League final where they lost to Inter Milan. 2) Inter Milan: Winner of the "treble" in 2010 under coach José Mourinho. In December they took the title as World Champions, surely making the Italians the most winning side of 2010. However, a poor fall season in the Italian league and unconvincing Champions Lague, including a firing of coach Rafa Benitez, does not put them on the top of the list. 1) Spain: Spain had until 2010 been the best nation in the world never to win a World Cup. In spite of not scoring many goals (and some poor performances later in the year against Portugal and Argentina), they were undoubtfully the best side, and deserved winners of the world title. It was not an easy list this year! There are some teams that nearly entered the list: Atlético Madrid, Egypt, Netherlands, Germany, Manchester City, Guadalajara and Shakhtar Donetsk. It is time for a review of football-year 2010, and I will start by my personal top-10 of best and worst football things this years. 9. Not having played football once during the year. 8. Time difference: Living in Venezuela has made it difficult to watch many mid-week matches, as they are in working hours. 7. FC Copenhagen doing so well; as a Brøndby fan I am green of jealousy! But of course, it is impressive! 6. Ghana's defeat in penalty kicks to Uruguay: so close, and yet so far from being the first African team in a World Cup semifinal! An emotional roller-coaster of a match that I watched with hundreds of people in Brussels! 5. People who normally don't watch football, who suddenly become all too passionate during a World Cup. 4. Argentina's elimination from the World Cup, which was more painful as I had really hoped for the best for them under Maradona. I do admit though, that his choice of tactics against Germany was poor. 3. FIFA and refereeing: although some small changes have been made, there is still too much conservatism and lack of openness in making refereeing better. In the World Cup, although in general good, some lousy decisions still haunt all fans. 1. Brøndby: not only that they are generally doing bad, but I was hugely disappointed for their loss to Sporting Lisbon. And now, the best, a list much harder to limit! 10. BBC's World Football Phone in: the best football show ever. 9. Inter Milan's impressive victory of the triple. Although not a popular team, they had José Mourinho, whom I consider the world's greatest coach. 8. Germany: impressive in the World Cup with a diverse, young and entertaining side, and the Bundesliga has also improved to become one of the leagues in Europe with most excitement and most goals! 7. That Valencia CF are back in the Champions League, and have done well. 6. I have not been to many matches this year; a couple of Copa Libertadores matches in Caracas, but Benfica-Braga in Lisbon, was surely the best! 5. The way FC Barcelona have been playing in the second half of the year, notably their 5-0 victory against Real Madrid, which I watched in the office, was a truly impressive display of awesome football. 4. Spain as World Champions made me most happy for all my family and friends there! 3. The marvelous Black Stars and their performance in South Africa, and in particular their fans! 2. A wonderful World Cup in South Africa! South Africans were the best hosts ever! 1. Watching World Cup football in five different countries, with friends, family and drinking beer! FC Copenhagen has surely been one of the teams of the year: they upset everyone by playing excellent football in the CL, coming second in their group, only behind mighty Barcelona, and will now face Chelsea in the Last-16. In the Danish League, no team has ever been so dominating as FC Copehagen is now: they are undefeated in the league, and as they go on winter-break, they are impressive 19 points ahead the second ranked OB. There is no doubt they will be champions, it is only a question of how many records they will beat. So is all this good for the Danish league? It seems doubtful. It is not the Danish league that has become better; it is FC Copenhagen that has run away from everyone else! While FC Copenhagen is not only well-managed, they are very rich compared to any other club in Denmark, and are sure to become more so. The other teams in the league are all pretty level: there are only 16 points between OB on second spot, and the bottom team AaB. Of the 12 teams, six or seven seem to be fighting to avoid relegation, while the remaining teams basically fight for the European spots, where one, given FC Copenhagen's success, may lead to another Danish CL spot. That would not be nice; as much as I would love to see my dear Brøndby have the opportunity, I only think they would be there to be humilliated. Bad for Brøndby, and bad for Danish football. FC Copenhagen's success is admirable, but it is not great to see the Danish league become a mono-league. Although Inter Milan just last week won the World Club Championship, it is perhaps not surprising that it was today when coach Rafael Benitez was fired after only six months. Benitez has been very critical of the Inter leadership, and as results have not been forthcoming (they are only 7th in Serie A and came second to Tottenham in their CL Group A), the firing of Benitez is perhaps not so surprising, in spite of the short time and many injuries on the Milan side. Benitez is a great coach (A CL title, a UEFA Cup Title, a Spanish Championship) but he apparently has a controversial personality that has often led him to part ways, as in Valencia, Liverpool and now Inter. It will be interesting to see where he will be heading next. More interesting will be to see who now takes over in Inter. The Brazilian Leonardo, with a history in AC Milan seems to be first choice. Whoever it ends up being, he will have a difficult task! One important thing to note about the tournament this year is that for the first time ever it was not a final between Europe and South America: Internacional from Brazil lost in the semifinal to the outside-Africa unfancied TP Mazembe from DR Congo (a great team, as any follower of African football would know), who also became the first African team in the World Club Final. Although many people do not fancy this tournament, it remains a great achievement by the Congolese side, as well as a great achievement for Inter Milan! I must add my voice to the choir of critics of the chosen finalists for the 2010 Golden Boot: three Barcelona players, Andrés Iniesta, Xavi and Lionel Messi are the contenders for this year's title as the world's best player. Barcelona are indeed a powerful team that plays the most entertaining football in the world, and these three players are indeed the spinal chord of the team. Add to this that Iniesta and Xavi are also the most important players of the world champions of Spain (with Iniesta playing a splendid World Cup, and scoring the winning goal in the final against the Netherlands), and it is obvious that these two players are obvious candidates for the title. Lionel Messi is splendid to watch, and has had a great fall season with Barcelona. But he was almost pathetic in the World Cup in an Argentinean side that started well but disappointed enormously when it counted. So the inclusion of Messi is odd, considering the one player that should have been among the finalists: Wesley Snejder. The Dutch player was splendid for Inter and in 2010 won the Italian championship, the cup, as well as the Champions League (defeating Barcelona on the way). At the World Cup Snejder was also splendid; the best player on a Dutch side that made it all the way to the World Cup final. Perhaps it is because Inter and the Netherlands have not played such entertaining football as Barcelona, and Snejder is not such a Playstation-player as Messi, but it just shows the entire strangeness of having a title as "world best player" in a sport that is about a team, and less so about an individual player. I don't know whether Snejder is "better" than Messi, but I think he surely deserves to be among the finalists. Manchester United-Valencia is for personal reasons one of the most classic matches in CL football, for the simple fact that I support Valencia, and I have seen them play the United times many times, including a match in 2000 in Valencia, where I saw them draw 0-0, and both were through, and I then got drunk with a bunch of United fans. Today, many years later, I was in Caracas, watching them in a bar, as they were playing another "irrelevant" match, fighting for 1st and 2nd place in the group. Valencia needed a victory, and admirably really went for the victory in a match that is probably the most entertaining between the two sides. 1-1 is a fair result of a match that puts Manchester in the first spot of the group, while Valencia can look forward to an interesting (and very difficult) draw. Today the hosts for the 2018 and 2022 World Cups were selected. It was widely expected that the winner of the 2018 bid would be in Europe, where England, Spain/Portugal and Russia were contesting. Following FIFA president Sepp Blatter's wish to spread the beautiful game further in new countries and regions (which admittedly gave us an excellent cup in South Africa), the choice of Russia for 2018 was not strange, and it will surely be interesting to see the World Cup there, amid strong anti-foreign feelings there. I really do wonder whether Russia is able or even willing to welcome the world to one of the greatest events that exist. Qatar will be even more interesting. The small Middle Eastern nation has never participated in a world cup, but invested enormous resources in their bid, and will surely have to invest even more in stadiums and infrastructure for their hosting in 12 years, but even more in actually having a competitive team! In any case, situated between Europe, Africa and Asia, good links and climate, it is surely to be one of the most memorable world cups of the 21st century, and surely already augur a new era in the spread of football around the world. Granted, I have never been a fan of Real Madrid, but this latest team, under the leadership of José Mourinho, was gaining my respect, until today. A great team emerges in the face of adversity. Until today against their archrivals of FC Barcelona, Real Madrid had cruised through the Spanish League, and expectations were therefore enormous for the match: two of the greatest teams in the world. But truth is, there was only one great team on the pitch today: FC Barcelona dominated every aspect of the match, and not only the 5-0 score was a humilliation of Real Madrid, but more so the way the Catalonians played around with the helpless Madrid players. It was a show of strength from Barca, but the way it ended for Madrid was not gracious. I understand players can get frustrated, but Sergio Ramos' slaughter of Messi and attack on Puyol at the end was much more than just frustration; it was the pathetic expression of a player that does not belong at this level. There is only one great team in the Spanish league, and it is FC Barcelona. Any football fan in his/her right mind should be looking forward to tonight's match between FC Barcelona and Real Madrid. Between them the teams assemble some 13 world champions and some of the best players in the world. It will be a splendid match. However, for the Spanish football league, this cannot be good. Last season these two teams completely ruled the league, and this season they are again far ahead of the third ranked team. Truth is, the Spanish league is a two-team league, just like the Scottish, where the rest of the teams have just been relegated to be mere spectators. Barcelona and Real Madrid win every week, and the only interest when they are not playing one another, is how large their margin of victory will be. Thus, the Spanish league may have the two best teams in the world, but it is surely not the best league: when matches between Getafe and Athletic Bilbao hardly raise an eyebrow, and the largest surprise is if Barcelona "only" wins 2-1 against Mallorca, it proves that the league is far less interesting than the English, Italian or German leagues, where competition is much closer, and there is a high standard. Again, while any fan must love two teams like Barcelona and Real Madrid, in the long run this cannot be healthy for Spanish football at large: there will be disillusion among other teams who simply cannot compete, and interest will fall, in the end creating a smaller future generation of new Spanish players. The Spanish football league, including Barcelona and Real Madrid, would do better to try to create a system like in Germany or England, where TV money is distributed more evenly and there is more possibility for teams to retain young stars. A more equal playing field can only be of interest to Spain! Portugal destroys the world champions! 4-0 is the largest a defending world champion has lost, and it was repeated tonight, with Portugal's 4-0 trashing of Spain in a friendly match in Lisbon. Granted, it was a friendly match, but just like Argentina's 4-1 victory earlier this year, these are valuable scalps for the winning side, and Portugal in particular. Portugal was plainly bad in the world cup under Carlos Queiroz, and were almost a walkover for Spain in the last-16. After the world cup, it would take a pathetic start to the Euro qualifiers (tie with Cyprus and a defeat to Norway) before Queiroz was fired, and the new coach Paulo Bento seems to have raised the standard of the side that always has potential but disappoints: in the Euro qualifiers Iceland and Denmark were defeated, and tonight's victory will sure raise the alarm in teams that have to face the rising Portuguese machine. Spain in the meantime cannot use this defeat for anything in spite of the huge humilliation it is to lose to its smaller neighbour, and even as defending world champions! When Valencia defeated Getafe 2-0 today, Tino Costa scored Valencia's goal number 4000 in the Spanish league. Quite a historical event in an otherwise boring match. Valencia is now 4th in the Spanish league, behind the local rivals of Villarreal. Anyway, both teams have way to go up to the leading teams of Real Madrid and Barcelona, who will, yet again, be fighting for the title. Fourth matches of the 2010-2011 Champions League Group stages have just been played, and we are beginning to see the contours of each group. Group A: Tottenham Hotspurs managed to defeat the defending champions of Inter Milan 3-1, and are now leading the group on better goal difference than the Italians. In the meantime FC Twente surprisingly won 0-2 away to Werder Bremen. They have five points, and if they manage to upset Inter in Milan in the next round, we would be looking at a sensation! Still, I believe Inter should carry the day in the end, and progress together with Tottenham (and wonderful to see an English team that is not Chelsea, Manchester United, Liverpool or Arsenal...). Group B: In group B Olympique Lyon had been looking awesome with three straight wins until their match against a reawakened Benfica in this round. In an exciting match, the Portuguese won 4-3 and now has two wins, and it only one point behind German Schalke 04 on second spot, who disappointingly only managed 0-0 with Hapoel Tel Aviv (the Israeli's first point). Benfica will be facing the Israelis in the next round while Shalke will be hosting Lyon. But it all could come down to an exciting last round match in Lisbon between Benfica and Scalke 04! Group C: Manchester United cruised through a 0-3 away victory to Turkish Bursaspor, and are now on first spot with 10 points, one victory away from making it to the next round. Their next match with take the Reds to Glasgow. Rangers will desperately be needing a victory after they lost 3-0 to Valencia, who seems heading steadily to second spot. However, note that with some strange results, we could be looking at a nervewrecking (for me) Manchester United-Valencia in the last round! Group E: Bayern Munich defeated CFR Cluj 0-4 away, and are with Chelsea the only team with four straight victories in the CL. In fact with today's victory, the chance of them not winning the group is very slim. This would have to happen by the hands of an AS Roma side that has not been convincing at all this season. They won 2-3 against Basel, but will have to defeat Bayern Munich and CFR Cluj by large margins if they are to take first spot. Although Roma seems in a better position, a defeat to Bayern Munich in the next match could mean that CFR Cluj and Basel could be playing for a possible second spot in the next round! Group F: Chelsea is looking awesome this season, and with a 4-1 victory against Spartak Moscow took their fourth straight win. With a score of 12-2, and the way that they have been playing, it seems unlikely that Chelsea can be threatened on first spot. In the meantime, the fight seems poised for the second spot: Spartak Moscow remains there with six points, but Olympique Marseille took a huge jump on goals (before tonight they had only scored one in the three previous matches) by a 0-7 away win against pathetic Zilina. Next round, Marseille is travelling to Moscow to try to repeat Spartak's 0-1 victory in southern France. It will be a nerve-wrecking match. In the meantime Zilina, with four defeats and a score of 1-15 probably just want this to be over with. Just not good enough for this level! Group G: Real Madrid was looking to completely close down the group in Milan, but in an exciting match they managed to equalize AC Milan's 2-1 lead in the last minute (where famous World Cup final referee, Howard Webb, had yet another match of controversial calls...). With ten points, Real Madrid are nevertheless certain to progress. AC Milan, on second spot with 5 points can theoretically threaten the Spaniards, but they should instead be looking behind them: Ajax Amsterdam are one point behind them, but only two points behind them French Auxerre came alive after defeating the Dutch side 2-1. Auxerre-AC Milan in the next round is bound to be interesting, as will Ajax-Madrid, as all three teams are fighting for the second spot! Group H: Arsenal had three straight wins, and when going ahead early against Shakhtar Donetsk were looking for their fourth. However, the Ukranians, playing at home, fought back to win 2-1, and the top of the group is now looking very exciting, with Arsenal and Shakhtar both with 9 points, and Braga just behind them on third with six points after defeating Parizan Belgrade 0-1 in Belgrade. Braga started the tournament by losing 6-0 to Arsenal, but when they receive the English side at home in the next round, they are hopefully going to be better motivated, seeing that they can completely turn around the group. However, as both Shakhtar and Arsenal have one match each against the poor Partizan side, it is most likely that both of them will progress to the next round. Some teams are already bound for the next round, some are out, but still need to fight to get there, and the coming matches will be much more exciting! Sergio Batista has been caretaker Argentina coach since the firing of Diego Armando Maradona after the World Cup. But amid confusing political maneuvering where Maradona's name has even come up again as candidate amid heavyweights such as Diego Simeone, Alejandro Sabella and Carlos Bianchi, Sergio Batista was today finally confirmed as the coach to take Argentina forward and build up a new team looking at the Copa América 2011 in Argentina. Batista has not had it easy as caretaker. Working to show he was the best man, he did not experiment much, instead using much of Argentina's veterans and established players. The impressive 4-1 victory against world champions Spain was such a match, where players such as Javier Zanetti and Esteban Cambiasso were outstanding, but will hardly be present at Copa América next year. So the best for Batista and for Argentina is to finally have clarity about the post, and finally look forward. There is no doubt that Batista has the skills to carry the team forward: as a prominent player in the 1986 World Cup side, he has also coached the Under-20 side, as well as the Olympic Gold medalists of Peking 2008. Surely a lot of challenges lies ahead, but finally this tiny step has been resolved. I think José Mourinho will go over to history as the greatest coach that ever lived. What he already achieved in FC Porto, Chelsea and Inter Milan far exceed what most coaches achieve (and note, as a true global 21st century football legioneer, he has done it in now four different countries! ), but what he is doing in Real Madrid is also impressive. Real Madrid has been a circus the last years, with a rotating door of coaches, many who seem to have been pressured to use the stars in a lineup that seemed more about individual players than about the team. Understandably, fans have often been annoyed. Everywhere he has been, Mr. Mourinho focuses on the team. No player is above the team, and he works to get the best out of every player. He has a superb eye for the form of the players and surely give them a lot of space and responsibility, something they also return. Real Madrid's new players are looking awesome: Mesut Özil and Angel Di Maria (as well as Khedira, although with a lower profile than these two) have all been splendid. They are young, and have benefitted Cristiano Ronaldo from the passes and space that these players give him. Yesterday he scored four goals against Racing Santander, with Mesut Özil as the frequent architect. Real Madrid has scored 12 goals in its last two home matches. Mourinho is certainly refuting his reputation as a defensive coach, but one must also mention that the team has so far only played "small" teams from La Liga (except for Espanyol). A big test will be in early November when they face Atlético Madrid, but surely the team is looking awesome. I think Mourinho is on the way to adding more trophies to his and Real Madrid's CV. One of the best players of all time, surely the most legendary and the one with the most goals, and icon of football, sports, and in fact, of Brazil and the century, turns 70 today. The birthday is being celebrated widely in Brazil, where Pelé is emblematic for the rise of Brazilian football with his debut as a 17-year old in the 1958 World Cup (scoring two goals in the 1958 World Cup final against Sweden) and then reaching his pinnacle as captain of the 1970 Brazilian World Cup side; perhaps the most entertaining and awesome national team ever. Who the best player in the world of football is, remains one of the most fervent discussions in world football. It is not a fair discussion, since great players have contributed different things at different times. I know my personal favourite (Diego Maradona), but I also know that perhaps nobody has meant as much for the spread of football as Pelé. Every football fan in the world should today take a moment and make a toast for this Giant. Back in the 1980s there was a Spanish player from Atlético Bilbao known as "the Butcher from Bilbao" for his uncompromising and outright violent tackles that injured many players, among them Gary Lineker and Diego Maradona. Harder refeereing has all but eliminated these kind of players, but once in a while some new "butchers" emerge, and one such is surely the Dutch Manchester City defender Nigel De Jong. De Jong became world famous for a karate kick he gave Xabi Alonso in the world cup final. This kick became a symbol of a Dutch side that was no longer playing the beautiful style they were usually famous for. But De Jong's sins are many: known as an uncompromising player, he managed to fracture the US player Stuart Holden's leg in a "friendly" match between the USA and Netherlands in March 2010, and this last weekend he repeated the feat of fracturing a player's leg when Newcastle's Hatem Ben Arfa was carried off the pitch in the Premier League match between their two sides. This last tackle has fortunately been widely condemned, and the Dutch national coach, Bert van Marwijck, has decided to exclude de Jong from the Dutch national team that will play two Euro 2012 qualifiers this week. This is surely a just punishment, but in fact, one of the worse things about de Jong has been the permissivenes of the referees; the situations with Alonso and Holden cost meager yellow cards, and for the Ben Arfa tackle, he wasn't even booked. Interestingly, the only one that has come out to defend De Jong is the Dutch captain Mark Van Bommel, another player whose tackles are not booked enough (and who should have had a couple of red cards in the World Cup). Are the referees becoming more permissive, or are the Dutch now creating a new generation of defenders who can mask their violence? No matter what, they don't belong in football. A lot of people would perhaps think this is a bad example to set by a president, but on the other hand, football is about passion, and if he has to lose his head, surely better he does it on the football pitch! The referee didn't give him a red card - of course, it is the president! I have been travelling a lot the last two weeks, but not missed out on football! 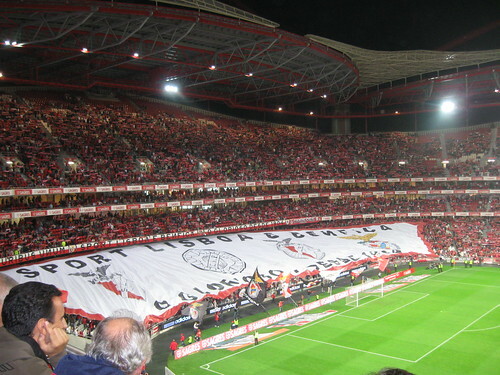 I was in Lisbon this weekend, and Sunday evening, decided to go to the legendary Estadio da Luz to watch the home side Benfica against Braga. These two teams ended first and second respectively in last season's Portuguese league, and are currently the Portuguese representatives in the Champions League. Braga has done badly in the first two matches in the CL, first getting destroyed by Arsenal and this last week they lost 0-3 at home to Shakhtar Donetsks. Benfica has a victory in the CL, but losing 0-2 to Schalke 04 still makes it a challenge for them to go through in a season that has started badly for them: before the Braga match they were only seventh in the league with 9 points for six matches, while Braga was fourth with 11, both trailing FC Porto, who started the season with six straight victories. It was therefore crucial for both teams to get a good result, and pressure was particularly on Benfica, whose play has been meagre this season. For me, it was also special to go to the legendary stadium, and atmosphere was truly extraordinary in spite of it not being sold out (there were 44,000 spectators). I was specially impressed by the start of the match where a real eagle (the eagle is the symbol of the team) is let loose to fly in the stadium, to the cheers of the spectators, and to land by the Benfica captain. Benfica were clearly the most motivated team, and played much better in the first half, where Braga was nevertheless disciplined in defence, including some splendid saves by the Braga goalkeeper Artur Moraes. Still, in spite of the dominance, Benfica, it seemed to me, lost too many balls, and is not entirely funcitoning as a team. In particular the elder Argentinean, Javier Saviola, worked hard as always, but lost many balls and missed some big chances (he was also taken out eventually). In the second half Benfica continued attacking, but for a while it seemed the air had gotten off the balloon, and both the fans and the team seemed more and more nervous as time advanced. But finally, in the 77th minute, Carlos Martins scored a beautiful goal where he took the ball down very well and kicked precisely behind the goalkeeper. It could have been 2-0, as Braga, in spite of clear Benfica nerves (and some nasty nervous tackles towards the end), couldn't really answer back. Benfica won 1-0, and because of the other results of this round, suddenly jumped to second spot (things are pretty close as there are three teams with 12 points and three with 11), but still 7 points behind the leaders of Oporto. However, this match may well mean that Benfica gets back the belief that they can again win the trophy this season! It has today been confirmed that Diego Maradona will not be coaching Argentina any longer. While his run as national team coach was neither horrible nor marvelous, it did seem that his charisma and passion for the game would carry him through. However, his demands for his entire staff to be renewed as well were simply too much for the Argentinean FA, who will now be looking for a new coach. Sergio Batista will take over as interim coach for a coming fixture against Ireland; having coached the U-20 national team and coached the Olympic gold team of 2008, he should be considered a good option for the post. However, Estudiantes de la Plata's succesful coach Alejandro Sabella should also be considered as a favourite for the post. No matter what, a spell of dreams has ended for Argentina under Diego Maradona. Many fans, including myself, had hoped that he could bring his magic from the 1980s to bear on the Argentinean national team, but although the dream lived for a little while, in hindsight, it was obviously just a dream. I am not unhappy that Mr. Maradona is leaving his post, but I am not happy either. It is probaby the best for the Argentinean national team, but no matter what, Diego Maradona remains the star above all stars. There are probably few players that symbolize Real Madrid so much as Raul, who got his debut in 1994, and has played 740 matches, scored 323 official goals for Real Madrid, contributing to winning three Champions League titles and six Spanish league titles. Although rumours have circulated for a while now, it is now official: Raul is leaving, and he is going to the German club Schalke 04. That he is leaving is not so surprising, but I think a lot of people, including myself, are surprised that he will go to Schalke 04. Although he will be playing Champions League football, and surely in a German league with great atmosphere, it seems notable that he did not choose to go to the Premier League, or to a more Mediterranean league like Italy, France, Greece, or even Turkey (where another old Real Madrid player, Guti, who also announced he is leaving Real Madrid, is likely heading). Schalke 04 is surely a good club, but not the kind of club that has attracted super stars. Raul's career is nevertheless ebbing, and it remains to be seen whether he will actually manage to become a starter on the German side. No matter what, this is the end of an era in Real Madrid. I am back in Venezuela after the world cup, to a long football hangover. Surprised was I to see that as I returned my great idol, the reason I love football, Diego Maradona, was coming to Venezuela as well, as a guest of president Hugo Chavez. On TV I saw him stand next to Mr. Chavez as the latter announced that he was cutting diplomatic ties with Colombia. I think the only amusing thing about it all was that I have never seen Maradona be so quiet! It is quite impressive that Mr. Chavez can make El Diego himself speechless! Maradona is still the greatest there ever was! But El Erik is also in Caracas! Football is passion, but people who don't watch it often should learn to relax: it is only football! 9) People who kept complaining about the vuvuzelas: the vuvuzelas rocked! 8) Some empty stadiums: Incredibly, there were some empty stadiums in the first rounds, and I am certain that they could have been sold out. Why!? 7) Defensiveness: In the first round in particular too many teams are more afraid to lose than prepared to win. The few goals scored in this tournament are also an expression of a tournament where most teams are not prepared to take risks. Fortunately, the winners were not one of these (although being very inefficient up front, Spain relied strongly on its defense to win). 6) Some referees: In general the referees were quite good, considering the lacking assistance they get from FIFA and from players. However, still some referees were appalling, most notably Mr. Webb in the final, who allowed too much from the violent Dutch. 5) African sides: The first World Cup in Africa, and all but Ghana were eliminated in the first round. In particular Nigeria and Cameroon were hugely disappointing. Even in the long-term, Ghana remains the most likely African World Champions. 4) The Netherlands: To reach the final the Dutch were stable and efficient, as well as outright nasty (notably Van Bommel should have gotten a red card many times during the tournament). It (almost) worked, but many people miss the beautiful and entertaining football that has made the Dutch admired and respected. 2) Paul the octopus: Who came up with this stupid idea of a psychic octopus...? Granted, it is funny, but as the tournament progressed the octopus got more attention and I personally got increasingly annoyed that it kept making better predictions than myself... Why not just cancel the next World Cup and let it make predictions - imagine how much money, time and nerves will be spared! 1) FIFA and technology: FIFA is a powerful and conservative organization that does not accept any criticism. Its stance on using some technology to improve the game is outright stupid: Lampard's goal against Germany was seen by the entire world, including the referees, within seconds of it happening, but still, the referees could not change!? I understand it is a more complex discussion, but intransigence to consider it in a game that moves billions, is stupid. 10) Andrés Iniesta: In my humble view, the King of the Tournament. 9) Diego Maradona: the most controversial person in football, and many would surely not put him on this list. But I do: he has been as refreshing as controversial, has tackled the pressure well, and made Argentina play good offensive football. In spite of Argentina falling apart against Germany, he remains one of the great memories of the tournament. Viva Diego! 8) Larissa Riquelme: Why one would unconditionally support Paraguay! 7) Uruguay: To many Uruguay were the surprise of the tournament. However, the small giants have an excellent team and a great history. The fact that they returned in Africa forty years after their latest semifinal also carries the symbolism that they were the first team to use black players nearly 100 years ago! 6) New Zealand: With three ties the Kiwis were in fact the only undefeated team of the tournament! Bravo for a team nobody expected anything from! 5) The finalists: The Netherlands played their third World Cup final while Spain played its first. Although both teams are giants, this was an unusual final, as it is the first final ever without the participation of Brazil, Italy, Germany or Argentina. 4) Ghana and their fans: Ghana is the best African team, and showed it again, being just one kick away from being the first African semifinalists ever. That they didn't make it was heartbreaking, partly for the team, but mostly for all Ghana's fans, who are surely the best fans in the world! The World Title for best fans went to Ghana! 3) Germany: Germany broke a lot of stereotypes with a young team that any football fan should look forward to seeing in the future. I was not expecting much of them, but was impressed by the German youngsters (notably Mesut Özil and Thomas Müller) who with style, pace and efficiency became the most scoring team of the World Cup. 2) Spain: World Champions for the first time ever, and breaking a longtime curse for the Spanish side. It has been amazing to see how they have united an otherwise disunited country, and knowing Spaniards, I am sure that the party was epic! Cheers! 1) South Africa: the country and people of South Africa silenced all critics (including myself) hosting a marvelous tournament, welcoming the world with hospitality, smiles and a gorgeous country. There are many world champions from this tournament, but South Africa is surely the foremost! On a personal note, I had the privilege of watching the world cup in five countries, continuously travelling, with friends, family, plenty of beers, smiles, laughs, frustration, disappointments, happiness.... This is what football is about! Still, I have to go cold turkey on this football overdose for now! Spain had until yesterday always been cursed by being the best nation to participate in a World Cup that had never won it. In fact, all they had was a meager semifinal in 1950 to talk about. After their triumph in the Euro 2008 Spain entered the World Cup as favourites and with enormous pressure to bring the long-awaited glory to Spain. It did not look well after opening with a loss to Switzerland (Spain is the first nation since 1978 to become world champion while losing a match on the way to the title), but that defeat may in fact have been Spain's luck: since that match the team seemed more aware of the task ahead, and looked at one match at a time. Seen as a whole Spain were the best team of the tournament, and a deserved world champion in a final were the Dutch in particular did not win any friends, and where a terrible referee came close to losing the match for everyone by allowing the Dutch to play like animals. That said, Spain have not been very efficient: eight goals in seven matches to take the title is not overly impressive, and although Spain has not been a defensive team there is no doutbt that the championship was won by their defence around Puyol and Piquet, and with the superb qualities of Xavi and Iniesta. There were seven Barcelona players in the starting lineup of Spain, and the influence of the Catalonian giants is clear in the Spanish style. First time a European side wins outside Europe. With Spain, a total of nine European countries have been in World Cup finals of the 12 nations that have ever had the honour. First time since West Germany in 1974, that a defending European champion takes the world title. The first World Cup final ever that did not involve one of the following: Italy, Brazil, Germany or Argentina. On a personal note, I have been very critical of Spain this year, but I am happy they won, mostly because of all my Spanish friends and family, who are surely still celebrating! Truth is that European teams simply had an awful draw, running into each other in the last-16, but that they could plausibly have been in all the semifinal matches like it was in 2006! Although three European giants, France, England and Italy performed poorly, the fact remains that Europe is the center of the world when it comes to football: the European championships are small world cups, and all the best football and players converges to the European leagues. When non-European players return to play for their home countries it is European styles and cultures they take with them, more so than they are giving it to European football! In footballing terms, Europe rules the world, and it is perhaps also symbolic that the first World Cup on African soil will also be the first which is won by a European team outside Europe (no, Uruguay does not stand a chance), since Europeans brought football to Africa, and in spite of its popularity on the continent, football is as European as any other of the imperialist exports of the old continent. In any case, no doubt that Europe rules the football world, and that this will continue for many years! In any tournament, only one team can win, and it is most often never the team you support... I have the luxury of having many countries I support, but that has apparently not changed the fact that it is never the teams I support that win: Denmark went out early, Ghana dramatically, and yesterday Argentina crashed spectacularly against Germany (who are making good use of their psychic octopus...). I watched the match in a bar on Place Luxembourg in Brussels. The place was full of fun Germans who of course were delighted at their team who have undoubtfully been the best team of the tournament, yesterday playing some world class counter-attacking football: Bastian Schweinsteiger was simply formidable, Thomas Müller again amazing (he will be greatly missed against Spain) and Miroslav Klose has now scored more world cup goals than Pelé... For the sake of football I believe that Germany is the team to support and for them to take the title. In spite of the great respect for the Germans and the cool fans in the bar, I was heartbroken and left at Germany's third goal. Argentina crashed spectacularly, but have been great to watch in this World Cup. Still, there will be much discussion on Maradona's choices, the weak defense and that Messi was another of the most spectacular flops of the tournament. Probably, Argentine football is only walking into yet another period of what it does most in its schizophrenic soul-searching. As to me, some days full of disappointments, but as with everything in life, I have learned not to expect too much. I will have some beers, continue watching (although with some melancholy) and well, congratulate Germany, and hope they win the World Cup! The play-off matches are the best thing about a World Cup, as it is when all the legendary dramas that capture nations and the world take place. Such a drama took place yesterday between Ghana and Uruguay: Ghana was as close as possible to be the first African team in a World Cup semifinal, while Uruguay played to reach the glory of former times. Both teams were organised, careful, but the match flowed well with chances for both teams. Uruguay was seriously weakened when Diego Logano had to go out with an injury, and only a few minutes later Sulley Muntari scored a great goal for Ghana. In the last second of the match Luis Suarez saved a ball with the hands on the goalline. As is usual, he got the harshest punishment, a red card (direct red card, so he will not play any more in this tournament) and a penalty kick for Ghana that undoubtfully would have put Ghana in the semifinals, but Asamoah Gyan did not take advantage of the punishment for Uruguay, and missed a horrible penalty to the delight of the Uruguayans. South American teams are excellent at penalty kicks, and Uruguay were no exception: a great goalkeeper and cold-blooded and skilled kickers gave Uruguay the victory and a place in the semifinals for the first time in 40 years for a team that has made history before. It was truly heartbreaking for Ghana, and it took me a bit of time to get past the drama. But truly, this kind of matches is what a football World Cup is all about, and I would rather not have been without it! Cheers for Uruguay and Ghana! I was at a training course for work as the match between Brazil and the Netherlands started. When the match was only some minutes old, I heard a loud cheer, and discreetely checked my phone to see Brazil had gone ahead. I left the course for the second half and went to a bar with a friend, and saw Netherlands play much better than a lame Brazilian side. After the Dutch equalized, and went ahead 2-1 by Wesley Sneijder, Brazil, who have otherwise been an awesome winning machine the last few years, completely lacked the creativity one often has connected with Brazilians. It was a poor Brazilian side, and the "not-so-Brazilian" style that Dunga has promoted over the last years will surely have to be reconsidered. A Brazil without stars and creativity fell disgracefully to a much more efficient Netherlands side who should now be considered favourites for the title. I saw many happy Dutch fans, and I am happy for them! European teams have disappointed in this tournament, and now Portugal should be added to the long list. The Portuguese never managed to threaten an organised Spanish side with an excellent David Villa, who will now be facing Paraguay in the quarterfinals. I watched the match in Place Luxembourg in Brussels, and among the many Spanish fans there, there is no doubt that after the initial disappointment against Switzerland they were again thinking of the final, and clearly thinking that Paraguay will be a walkover (something echoed again in the uncritical Marca.es). No doubt Spain are huge favourites, but don't sell the skin before shooting the bear! I must admit that what I knew about Chile before the World Cup was from the international news, and only two matches had I seen with them, where they had nevertheless impressed against poor opposition (Denmark and Venezuela). That said, I knew their coach, Marcelo Bielsa: a wanna-be intellectual and Menotista who insisted on offensive football. He was a flop as Argentinean coach in the 2002 World Cup, but his apparent results with Chile were notable, and Chile was highly rated before entering the World Cup. I was not impressed by Chile finally seeing them in South Africa: a lot of possession; yes, and offensive football; yes; but in all other facets Chile were outright second-rate: they hardly had any quality shots on goal besides their possession, and nice little touches were nothing to handle against defensive teams like Honduras or Switzerland. Against a tougher team like an unconvincing Spain they committed grave mistakes and posed no real threat. And finally, today against one of the best teams in the world, all weaknesses of Chile's and Bielsa's style were simply exposed to the world: Brazil were far superior without even trying, and with a simple organised defence, two outstanding backs and a strong midfield, hardly had to try their best to defeat Chile 3-0. Bielsa was a flop for Argentina, and although he has done more for Chile than most would have expected, his football philosophy has proved a flop in today's modern football, and that is the only conclusion one can draw from Chile's exit of the tournament today! After their first match against Australia, Germany impressed. In the play-off match today I was expecting that the English, who have not impressed, would be inspired by their Italian coach to play cynically and defensively to win a narrow victory against the young German side. However, how delighted am I to have been wrong! This is surely one of the most exciting German teams ever, and they were far superior to the English, besides being entertaining and cold-blooded at the most important moments. No matter that England had a clear goal disallowed (this was clearly the most appalling refereeing decision of the tournament, and revives what I have been saying for ages: technology or goal-referees), Germany was by far, by far, the best team. In particular the youngsters Mesut Özil and Thomas Müller were spectacular (Müller scored twice) and augur very well for the German future, but also for the match against either Argentina or Mexico. England... Another huge disappointment. I was also expecting them to do better after their excellent qualification campaign, but they have played awfully, and this defeat just underlines it by being the largest English defeat in a World Cup, and the largest defeat to the German arch-rivals. The speculations about why it is like this, but perhaps the simplest explanation simply is that England are not that good; during this World Cup they have been mediocre to say the least, and they are standing in front of a massive renewal of their team. But congratulations to the wonderful German team and to their great fans!!!! Cheers! Today England and Germany will face one another in one of the most classic rivalries in international football. The matches between these two European giants have always been immersed in drama, and cultural, historical and social associations. The 1970 World Cup quarterfinal, where Germany got their revenge for the 1966 final: England were 2-0 up but the Germans managed to equalize and won 3-2 after extra time. The 1982 World Cup second round group match, which ended 0-0, and was enough to send the Germans through to the semifinals. Quarterfinal of Euro 1972 (back then it was played in two-legs at home and away), where the Germans won 3-1 at Wembley (Germany's first victory there) and the teams tied 0-0 in Berlin. Germany went on to win the entire tournament. The Euro 1996 semifinal: England was playing at home and had huge expectations to win the tournament. But the Germans were in the way in the semifinal, which as 6 years before in the World Cup, ended 1-1 and went into penalty kicks, which the Germans won. First round of Euro 2000: England defeated Germany 1-0 in the group stages, but this did not matter to either team, who were eliminated by Portugal and Romania. For the 2002 World Cup the two teams were in the same qualifying group, and Germany won 1-0 in London, but were destroyed 5-1 in Munich in what still remains the largest victory for England between the two countries. The last time the two teams played was in a friendly match (as friendly as it gets between the two) in Berlin in 2008 which England won 2-1 on a late goal by John Terry. That the teams will be facing each other already in the 2010 World Cup is perhaps a bit of a surprise: England was probably expecting to win their group, while the young German team (it is one of the youngest German teams ever to play in a World Cup) surprised positively by winning their group. Because of the relative inexperience of the Germans, England is probably a slight favourite, although there is no doubt that Germany played far better than England in the group stages. The English will have to play far better if they are to have a chance against this German side, although I would not be surprised if they will have set themselves up for the challenge. This match should be obligatory for everyone, as it will only add another drama to the long history of football rivalry between England and Germany! I am an unapologetic fan of the Black Stars and I wish I had been in Accra for the post-match celebrations! Instead I was in a pub in Copenhagen, but still delighted at the Ghanaian victory after extra time. I have for ages been saying on this blog that Ghana is the best African football nation, and now they are among the top eight in the world, something I was nevertheless not expecting: I thought USA had shown stronger fighting spirit and that the Americans would ultimately prevail against Ghana's inefficiency and personal mistakes. But I could not have been more wrong: Ghana's young players have learned to pace themselves in such a tournament from their already strong experience in Africa's Cup and diverse youth world cups (and they are u-21 world champions, let us not forget! ), and play with the at-times necessary cynicism. Even when USA put pressure on the Ghanaians, these did not lose their heads, and even better, they punished the US mistakes that I was expecting the Ghanaians to make. Playing like this Ghana could go all the way, but it will certainly not be easy in a quarterfinal against a Uruguay side that is also extraordinary in pacing their game, experience, and some extraordinary strikers! In the meantime, congratulations Ghana! The African teams have disappointed, with only one, Ghana, progressing on to the next round. All South American teams have progressed to the last-16 and thus this has been by far the best continent. South American is the powerhouse of the world! With USA and Mexico there as well, the western hemisphere has emerged as the dominant footballing power. Asia, with two teams, is doing surprisingly well, but the continental power is surely Oceania (Australia is now qualifying through Asia), whose only participant, New Zealand, has been undefeated! All this said, this has been a very low-scoring tournament, with an average in the first round of 2.10 goals per match, potentially making it the tournament with the least goals ever. Uruguay: surprised many, but their attacking power and strong and organised defense should be a surprise to nobody. Spain: Started badly, but certainly deserve to be in the last-16, and remain huge favourites as true strength is shown in the face of adversity. USA: Won a difficult group, with disciplined and organised football, as well as a good fight. They will be extremely difficult to defeat. Germany: I was very surprised about the young side who cruised through Australia, was unlucky against Serbia and organised against the Ghanaians. They are surely one of the most exciting teams. France: simply a soap opera and a lousy joke. Italy: they have been absolutely pathetic in their matches, and deserved the loss to Slovakia, although they showed some will towards the end of the match. Serbia: Serbia was awesome in qualification and came in with a very experienced and strong team. Nevertheless, they played poorly and their early exit was well-deserved but unexpected. Cameroon: African sides have disappointed, but perhaps most of all Cameroon, with three consecutive defeats. South Africa: The first hosts ever to get eliminated in the group stages, and that says it all. The last-16 will be really exciting! It is a wonderfully diverse group of teams, with 5 South American sides, two from North America, two Asian, six European (who will all be facing one another...) and disappointingly only one team from Africa, Ghana, who will have all the support of Africa and from most of the world for their match against the USA. I believe that Uruguay, who has been strong and disciplined, will defeat a Corean side that has not been convicing, although they have been well-organised. Still, I believe Uruguay are by far the better team. I support Ghana, but their poor striking force will be their doom against a strong USA side, where Landon Donovan has been the saviour. USA will make it to the quarterfinals. Germany-England will be a repeat of one of the most classic matches of international football, and the match will be another drama to go over to history. That said, neither team is as brilliant as their history, but I believe that a slightly more cynical England side will win against a German team that I would nevertheless much rather see through. Argentina has been great, and I believe that they will carry the day against Mexico, although as in 2006, it will not be easy, and likely be a close match where the Mexicans will be their usual dirty. The Netherlands should be in the quarterfinals, and I see them as the greatest favourites in the last-16 against Slovakia, although the Slovakians showed that they should not be underestimated! Chile and Brazil will be a great South American encounter, but Brazil will surely win. Chile are charming and offensive, but as inefficient up front as a team full of grandmothers, and with so many mistakes in defense that Brazil will surely win. Paraguay-Japan is sure to be an exciting and close match, but an organised Japan team, with some extraordinary and quick players, should carry the day against an organised but at times inefficient Paraguayan side. Portugal-Spain is, with England-Germany, to be one of the most exciting matches of the tournament. Spain is by far the better side than the Portuguese, but the latter will be very excited for this match. I believe the sensation will be there, and Portugal will win a close match, perhaps after extra time and penalties. Spain managed to defeat Chile 2-1 in a match that in the end did not turn out as dramatic as one was expecting. Still, Spain's victory could put Chile out of the tournament in case Switzerland, as most expected, could defeat Honduras by at least two goals (unless Spain had scored more against Chile). But the mighty defenders of Switzerland were unable to create a match against Honduras, who in the end came closest to winning. In spite of the sympathy with the Swiss victory against Spain, Swizterland is a boring defensive side, and the World Cup is only better without them in the last-16, where Chile and Spain are the wish of any football fan!